Package of 11 Surgical Steel 11 Internally Threaded Tops and 11 Bottoms - 22 Piece Total. Tops measure 4mm bottoms size: 2.0 mm. 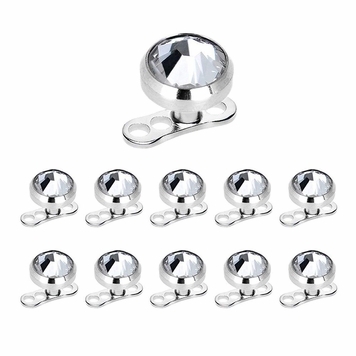 Base Made of Surgical Steel Features Press-Fit 4mm gem COMFORTABLE TO WEAR: Well Priced Piercing Set; With Expensive Looking; Comfort Fit Design; Easy to Put on and Won't Easy to Slip Off.